An estimated 2.5 million people work every year in domestic services, helping us take care of our children, cleaning our homes, and caring for our aging parents and grandparents, but without protections or basic workers’ rights. Sexual harassment, racial oppression, and economic exploitation have all resulted from domestic workers’ omission from federal and state protection laws, which is why the struggle for domestic workers’ rights is tied to the history of racial discrimination in our country. Today, that history is taking a turn for the better. 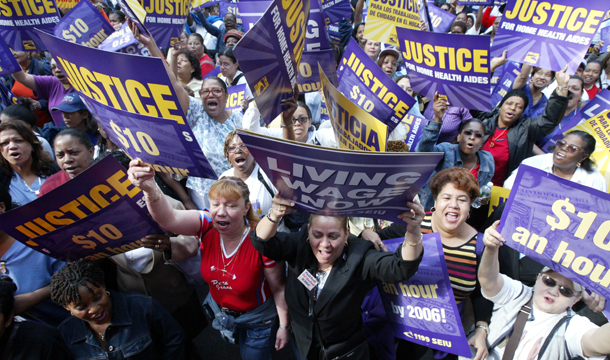 After years of activism and advocacy, the first Domestic Workers’ Bill of Rights passed in New York in November 2010. Now, organized labor, civil rights groups, and their legislative allies have joined together in support for a Domestic Workers’ Bill of Rights in California. These important efforts need to be replicated across the country. We cannot stand witness to the daily struggles of domestic workers in silence. Maids, child care workers, and home health aides lack worker protections as a result of exclusion from key federal legislation: the Fair Labor Standards Act and the Occupational Safety and Health Act. The Fair Labor Standards Act of 1938 establishes the minimum wage to ensure employer wage and hourly compliance. Unfortunately, FLSA omits child care workers and home health aides. More than 60 percent of child care workers in New York, Chicago, and Los Angeles reported minimum wage violations according to a 2009 UCLA survey. Similarly, the Occupational Safety and Health Act of 1970 aims to assure safe working environments for all laborers but leaves out domestic workers. A San Francisco Department of Public Health report from 2010 stated that domestic workers face health risks due to adverse working conditions. Without OSHA coverage and regulation, domestic workers will continue to face hostile working environments. Despite the absence of vital federal protections offered to domestic workers, individual states can still confront this serious issue. The Domestic Workers’ Bill of Rights in New York grants domestic workers basic protections and inclusion under some labor laws. The bill gives domestic workers right to a full 24 hours off each week. It also grants overtime pay based on the regular rate of pay and three paid days off. Furthermore, antidiscrimination and antiharassment laws in New York now apply to domestic worker employers. Domestic workers are still not covered by OSHA regulations and do not have the right to collectively bargain, but there is a state government study reviewing the feasibility of collective bargaining rights. Granting domestic workers collective bargaining rights would amend the historical discrimination against domestic workers. The 1935 National Labor Relations Act (also known as the Wagner Act) gave workers in the private sector the ability to create labor unions and the right for collective bargaining. Southern Democrats at the time insisted on leaving out domestic workers and farm workers in order to minimize the economic power of blacks. After the Civil War, blacks in the South were mainly employed as sharecroppers, housekeepers, and caregivers, and remained in economic servitude. Unfortunately, the racial demographics have not changed much over 76 years. Today, women, foreign-born persons, and persons of color account for 95 percent of domestic workers. The injustices of the past are reason enough to address this problem, but the projected growth in the domestic services industry makes this an opportune time to endorse the rights of domestic workers. The elderly population is projected to rise from 8 million to 19 million, and those in need of long-term care are also expected to rise from 13 million to 27 million by 2050. As the baby boomer generation ages, the Bureau of Labor Statistics anticipates a 50 percent increase in the home care sector and home health aide sector between 2008 and 2018. The growth of this industry must be matched by the enactment of the essential protections that will ensure just working conditions for home care providers and their housekeeping and child care counterparts. To protect current workers and those recruited in the coming boom, the AFL-CIO is one of many labor organizations to join the fight for domestic workers’ rights. The AFL-CIO signed partnership agreements with the National Domestic Workers Alliance and the National Guestworkers Alliance on May 10, 2011. This partnership is a dramatic step toward a more unified labor coalition that promotes the rights of all workers regardless of industry or work status. The incorporation of guest workers is paramount in addressing the victims of labor trafficking. Case in point: The New York Times reported that approximately one-third of annual labor trafficking victims in the United States are migrant housekeepers and care providers. Labor trafficking lures immigrants with false and misleading information and entraps immigrants in abusive employer-employee relationships. We need to continue to support domestic workers rights legislation to ensure fair treatment among all employers with particular concern for labor abuses that directly affect the historically marginalized. California, one of five states with a population that is comprised of 50 percent or more people of color, has recently taken on the task of redressing the plight of domestic workers with proposed legislation, the California Domestic Workers Bill of Rights (AB889), which is largely based on New York’s Domestic Workers’ Bill of Rights. By the year 2050 the United States will have a “majority-minority” population and mirror the diversity currently seen in California. Inaction on domestic worker protections in light of the United States’ shifting demographics and the professions’ landscape only reinforces the economic disparities that will persist if nothing is done where workers of color are vulnerable. With our changing population and consequent demands on our workforce, we can no longer ignore affronts to the dignity of workers who perform vital services in our country. The passage of the domestic workers’ rights bill in California could help bring these state movements to the national scale. All domestic workers need more worker protections and should not be excluded from national labor laws. After all, domestic workers are often the ones who make other work possible—without them, service-based economy would not function. By committing ourselves to protecting the rights of domestic workers, we are also committing ourselves to gender equality and racial justice. Learning to integrate groups of our society who have long been left out of the system for legal protections is imperative for future progress in our country. Kyle Boyd is an intern at the Center for American Progress working with Senior Fellow Sam Fulwood III and the Project 2050 team on issues of racial justice.